^ 1.0 1.1 1.2 JPL Small-Body Database Browser: 67P/Churyumov-Gerasimenko. NASA/Jet Propulsion Laboratory. 5 October 2013 [21 January 2014]. ^ 2.0 2.1 2.2 2.3 Baldwin, Emily. Measuring Comet 67P/C-G. European Space Agency. 6 October 2014 [7 October 2014]. ^ Baldwin, Emily. Determining the mass of comet 67P/C-G. European Space Agency. 21 August 2014 [21 August 2014]. ^ Dambeck, Thorsten. Expedition to primeval matter. Max-Planck-Gesellschaft. 21 January 2014 [19 September 2014]. ^ 5.0 5.1 5.2 Mottola, S.; Lowry, S.; Snodgrass, C.; Lamy, P. L.; Toth, I.; 等. The rotation state of 67P/Churyumov-Gerasimenko from approach observations with the OSIRIS cameras on Rosetta. Astronomy and Astrophysics. September 2014, 569. L2. Bibcode:2014A&A...569L...2M. doi:10.1051/0004-6361/201424590. ^ 郭洋. “罗塞塔”追星之旅回眸与展望. 新华社. 2014-11-12 [2014-11-19]. ^ 7.0 7.1 7.2 Yoshida, Seiichi. 67P/Churyumov-Gerasimenko. Aerith.net. 30 December 2010 [9 February 2012]. ^ Krolikowska, Malgorzata. 67P/Churyumov–Gerasimenko – potential target for the Rosetta mission. Acta Astronomica. 2003, 53: 195–209. Bibcode:2003AcA....53..195K. arXiv:astro-ph/0309130. ^ Agle, D. C.; Cook, Jia-Rui; Brown, Dwayne; Bauer, Markus. Rosetta: To Chase a Comet. NASA. 17 January 2014 [18 January 2014]. Release 2014-015. ^ 10.0 10.1 10.2 10.3 Chang, Kenneth. Rosetta Spacecraft Set for Unprecedented Close Study of a Comet. The New York Times. 5 August 2014 [5 August 2014]. ^ 11.0 11.1 11.2 Fischer, D. Rendezvous with a crazy world. The Planetary Society. 6 August 2014 [6 August 2014]. （原始内容存档于2014年8月6日）. ^ 12.0 12.1 12.2 Bauer, M. Rosetta Arrives at Comet Destination. European Space Agency. 6 August 2014 [6 August 2014]. （原始内容存档于2014年8月6日）. ^ Scuka, Daniel. Down, down we go to 29 km – or lower?. European Space Agency. 10 September 2014 [20 September 2014]. ^ 14.0 14.1 Chang, Kenneth. European Space Agency’s Spacecraft Lands on Comet’s Surface. New York Times. 12 November 2014 [12 November 2014]. ^ Probe makes historic comet landing. BBC news. 12 November 2014 [12 November 2014]. ^ Klim Ivanovich Churyumov. International Astronomical Union. [8 August 2014]. ^ 17.0 17.1 Kronk, Gary W.; 等. 67P/1969 R1 (Churyumov-Gerasimenko). Cometography: A Catalog of Comets; Volume 5: 1960-1982. Cambridge University Press. 2010: 241–245. ISBN 052187226X. ^ Buckley, Michael; Villard, Ray; Christensen, Lars. Hubble Assists Rosetta Comet Mission. HubbleSite.org. 5 September 2003. ^ Agle, D. C.; Brown, Dwayne; Bauer, Markus. Rosetta's Comet Target 'Releases' Plentiful Water. NASA. 30 June 2014 [30 June 2014]. ^ The twofold comet: Comet 67P/Churyumov-Gerasimenko. Astronomy.com. 17 July 2014 [18 July 2014]. ^ Temming, Maria. Rosetta's Comet has a Split Personality. Sky & Telescope. 17 July 2014 [18 July 2014]. ^ Gannon, Megan. Comet-chasing Euro-probe could make history Wednesday. Christian Science Monitor. 4 August 2014 [6 August 2014]. ^ Lakdawalla, Emily. Finding my way around comet Churyumov-Gerasimenko. The Planetary Society. 15 August 2014 [15 August 2014]. （原始内容存档于2014年8月15日）. ^ Chang, Kenneth. Philae Lander Nears a Cosmic Touchdown. New York Times. 10 November 2014 [11 November 2014]. ^ Amos, Jonathan. Rosetta comet mission: Landing site named 'Agilkia'. BBC News. 4 November 2014 [9 November 2014]. ^ Hilchenbach, M. Simulation of the Landing of Rosetta Philae on Comet 67P/Churyumov-Gerasimenko (PDF). SIMPACK User Meeting. 9–10 November 2004. Wartburg/Eisenach, Germany. : 25. 2004 [6 August 2014]. ^ Ellis, Ralph. pace probe scores a 310-million-mile bull's-eye with comet landing. CNN. 13 November 2014 [13 November 2014]. Comet 67P has a very weak gravity, so anchoring harpoons were designed to shoot into the comet to fix the spacecraft to the surface. ^ O'neill, Ian. Rosetta's Lander Grabs Onto Comet and Lands. Discovery News (Discovery Channel). 12 November 2014. harpoons, landing leg ice screws and thrusters needed to work in concert to ensure Philae stayed in place. ^ Agle, DC; Brown, Dwayne; Bauer, Markus. Rosetta's Comet Lander Landed Three Times. NASA. 13 November 2014 [13 November 2014]. ^ Staff. Rosetta's Frequently Asked Questions. European Space Agency. 2014 [12 November 2014]. 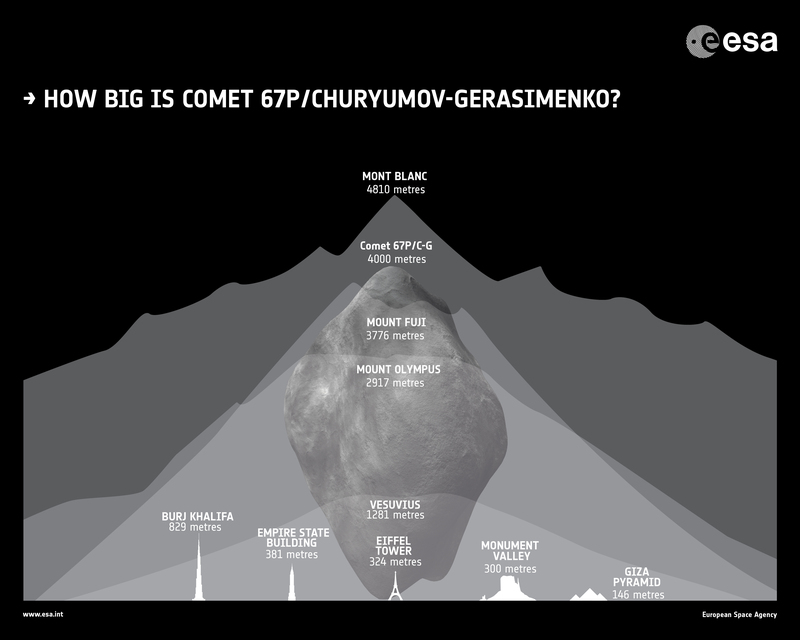 ^ JPL Close-Approach Data: 67P/Churyumov-Gerasimenko. NASA/Jet Propulsion Laboratory. 29 June 2010 [9 February 2012]. ^ Kinoshita, Kazuo. 67P/Churyumov-Gerasimenko. Comet Orbit. 7 May 2009 [25 April 2009]. ^ 67P/Churyumov-Gerasimenko. Minor Planet Center. [17 June 2014]. ^ 36.0 36.1 Elements and Ephemeris for 67P/Churyumov-Gerasimenko. Minor Planet Center. [9 August 2014]. （原始内容存档于2014年11月4日）. ^ VLT Tracks Rosetta's Comet. European Southern Observatory. 8 September 2014 [8 September 2014]. 阿加瓦爾, 潔西卡; 等. 2004年和2006年之間，丘留莫夫－格拉西缅科彗星的足跡. 伊卡洛斯. June 2010, 207 (2): 992–1012. Bibcode:2010Icar..207..992A. arXiv:1001.3775. doi:10.1016/j.icarus.2010.01.003.